Principal Heather Munroe-Blum announced that today the Board of Governors of McGill University has approved the appointment of one of McGill’s own leading medical researchers and administrators, David H. Eidelman, as Vice-Principal (Health Affairs) and Dean of Medicine. 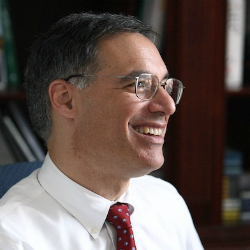 Dr. Eidelman currently serves as Chair of the University’s Department of Medicine. A McGill graduate and a native Montrealer, Dr. Eidelman has been a leading clinician-scientist based at the Meakins-Christie Laboratories, where his work has focused on the development of important models of asthma in animals and the application of tissue culture techniques to the study of the mechanisms of respiratory disease. Currently President of the Canadian Association of Professors of Medicine, Dr. Eidelman has been an active leader in clinical medicine and research in Canada and internationally. In addition to his research and leadership skills, Dr. Eidelman brings to this position extensive knowledge of the health care system having served as Physician-in-Chief at the McGill University Health Centre (MUHC) since 2004 and previously as the Director of McGill’s renowned Division of Respiratory Diseases. “He knows McGill and he knows Medicine. He has a simply stellar track record and great promise. We all look forward to working with him in building further our Faculty of Medicine and the McGill Academic Health Network as innovators and leaders in medical education, research, and service, for Quebec, and for Canada, broadly, and reflecting the highest international standards,” Principal Munroe-Blum noted. Following completion of his undergraduate medical education at McGill in 1979, Dr. Eidelman pursued training in internal medicine at the University of Toronto, first at St. Michael’s Hospital and subsequently at the Toronto General Hospital. He then returned to McGill to undertake advanced training in respiratory medicine. Upon completion of his sub-specialty training, Dr. Eidelman undertook research training first at the Royal Victoria Hospital and subsequently at the Meakins-Christie Laboratories. Dr. Eidelman then joined the faculty of the Department of Medicine in the Respiratory Division and as a member of the Meakins-Christie Laboratories. His research interests have been focused on the physiology of the airways, particularly as applied to inflammatory disorders such as asthma and cystic fibrosis. His current work is focused on the immunology of obstructive lung diseases including asthma and chronic obstructive lung disease. Dr. Eidelman’s clinical appointments took him from the Montreal Chest Hospital (later Institute) to the Royal Victoria Hospital and eventually to the Montreal General Hospital. In his role as Chair, Dr. Eidelman supervised a department with more than 800 faculty members of whom 420 are full time, including approximately 250 clinician-teachers based in McGill’s teaching hospitals, primarily the Montreal General and Royal Victoria Hospitals of the McGill University Health Centre (MUHC), and the SMBD-Jewish General Hospital. Organized into 13 divisions, the Department is the major clinical teaching unit of the Faculty and generates more than $40 million in peer-reviewed research grants per year. Dr. Eidelman will assume his responsibilities as Dean and Vice-Principal on Jan. 1, 2012, after returning from his leave at the Brigham and Women’s Hospital, a Teaching Affiliate of Harvard Medical School. Recognized as one of the top medical schools in North America and internationally renowned, McGill University’s Faculty of Medicine has a long tradition of excellence. Founded in 1829, it was McGill’s first faculty and the first medical faculty in Canada. As a leading Canadian medical research university, McGill has been at the helm of breakthroughs in key areas such as biomedical science, epigenetics, neuroscience and stem cells and regenerative medicine. Recent discoveries include the identification of genes that lead to breast cancer, memory loss, spina bifida and type-2 diabetes. Our Faculty comprises over 3,500 faculty members, close to 4,500 students, and more than 600 administrative, technical and other support staff. It encompasses three allied health sciences schools – Nursing, Physical & Occupational Therapy, and Communication Sciences and Disorders – over twenty departments, and numerous institutes and centres, among them, the Life Sciences Complex, the renowned Centre for Studies in Aging, the cutting-edge Arnold and Blema Steinberg Medical Simulation Centre, the McGill University and Génome Québec Innovation Centre, and the Montreal Neurological Institute.